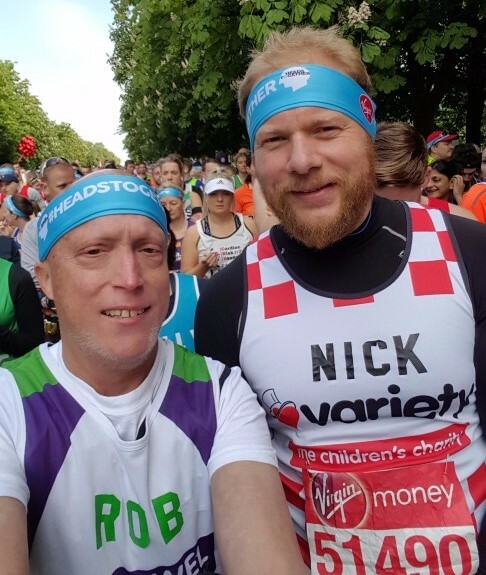 My name is Rob Morgan and I would like to share my story of how I completed the London Marathon in 2017 to raise money for Bowel Cancer UK. In February 2015 I was diagnosed with Stage 4 Bowel Cancer that had spread to both of my lungs and my liver. My Oncologist gave me a prognosis of between 24 and 30 months to live. I immediately started chemotherapy, which, apart from a short break in late 2015, has continued every 2 weeks up until the present day. In June 2016 my life changed massively for the better – my wife gave birth to our first child, a little girl named Ruby. It is very difficult emotionally to have a child knowing that you won't get to see them grow up, that they wont have you around growing up and that in all probability they wont have any memory of you. I wanted to do something special for her that she would hear about as she gets older. I also wanted to set a good example to her and show her that she can do anything she wants if she wants it enough and is willing to work hard for it. I decided I would try to get a place in the London Marathon. 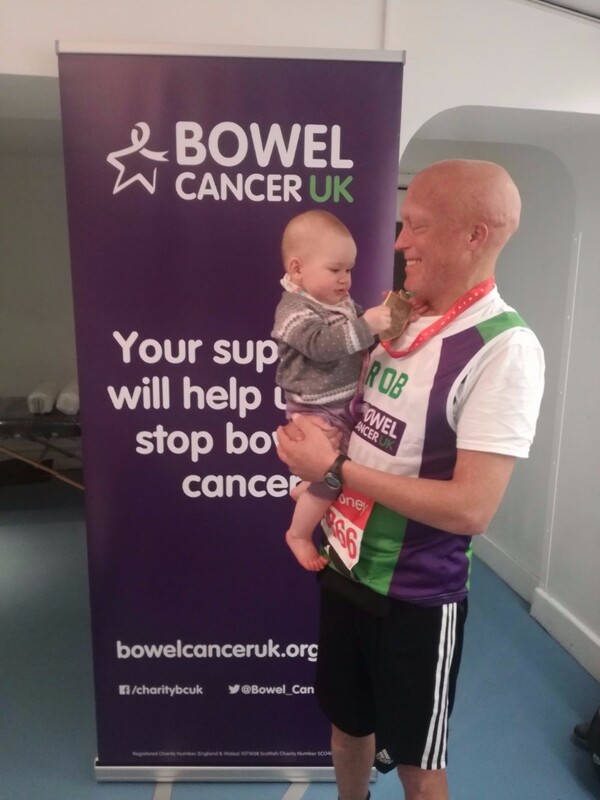 Bowel Cancer UK was the first charity I approached and shortly after Christmas they confirmed that a space had become available and that they would be honored to have me on their team. My starting point, fitness wise, was as low as I have ever been in my life. I used to be a keen cyclist but my bike had not seen the light of day in 2 years and during that time my body had gone through around 40 rounds of chemotherapy. I downloaded the official London Marathon beginners training guide and began to follow it. My first run was a 20 minute “easy” run. There was nothing easy about it! I struggled and didn’t manage to run for 20 minutes, I walked for some of it and even when I ran I wasn’t anywhere as fast as I hoped. The next run was 2 days later and 30 minutes – I managed to run the whole way although my pace was still well below what I hoped. It was time to re-assess my expectations. I had to accept the fact that the chemotherapy was going to severely impact my ability to do this training and the run itself. I was going to find it very hard to build up any decent level of fitness no matter how much I ran. My revised aim was to simply complete the marathon and run the whole way. Having this revised aim helped me massively. It took the pressure off my speed and allowed me to actually enjoy going out running. The initial diagnosis was runner’s knee – inflammation of the tendon that runs along the outside of the knee. Further investigation revealed that the problem was actually bruising of the bones in the knee caused by particularly loose ligaments and general problems with my right hip that goes back to my childhood. The only thing I could do was rest it – I did do some training with painkillers but I didn’t want to cause a long term injury that would prevent me doing the race. Time again to re-assess my aim… to simply get around the course. I continued with the training, but running on average once a week to keep the strain on the knee down and going spinning once a week. My distances were gradually increasing until with about 5 weeks to go I reached 15 miles, which I was very happy with. My last long run was 3 weeks to go and 13 miles, although I did suffer a lot with my knee. I didn’t manage any more runs before the day, taking my physio’s advice to rest and give my knee the best possible chance of getting around the course. The day itself was brilliant. The nerves in the build up and the carnival atmosphere were totally unique. In my opinion the first 7 or so miles were by far the best – so many pubs and flats playing music to spur us on and not much pain in the legs. As soon as I passed cutty sark things got difficult – The long stretch from Bermondsey to Tower Bridge was very tough, the weather was hot and I was beginning to get tired. Turning right onto Tower Bridge road, seeing the bridge and running over it was a very special moment. One that I will treasure forever, real goosebumps stuff. After that it’s right onto the highway past halfway and the real hard work began. I decided to walk for a while, and ended up walking the rest of the way. he last mile or so was a lot of fun. Lots of my family had gone to the embankment to watch so I saw them at various points. I then turned right past big ben and decided to try to run the rest of the way… that lasted about 500m! The worst thing about the last mile is that there are signs every 200m telling you how far is left. Not helpful for me! I did run the last stretch along the mall and across the line and was almost reduced to tears as I collected my medal. I am extremely grateful to Bowel Cancer UK for the post race massage and a nice place to meet my family. We got some lovely photos of me with my daughter and again I was nearly reduced to tears. I have to say I did not get that feeling of wanting to do it again… I had been told that marathons can be addictive and that I should be prepared to want to go again. Not for me. This was one time only: my daughter will be proud forever, I raised about £10,000 for a cause very close to my heart and I achieved something I never thought I would. If Rob has inspired you to take up a challenge then do take a look at our fundraising page.